Gearing up to demolish the BJP’s main poll plank of corruption, the Congress is all set to explode the “hard disk” bomb to expose former Chief Minister P.K.Dhumal and target some other party leaders close to him. Chief Minister Virbhadra Singh today sanctioned Rs 1 lakh for the treatment of Vivek Kumar Sareen, a class XI student of this town, who had been diagnosed with malignant bone tumour (osteosarcoma ) by doctors of the PGI, Chandigarh. Vivek was advised to get his knee replaced to save his life but he was craving for aid in view of his financial condition. The Himachal Pradesh High Court today issued notices to the state, centre, BSP leader Vijay Singh Mankotia and state BJP leaders in three different petitions pertaining to release of CD filed in the court. Expressing keenness to establish a foothold in the state, the Samajwadi Party(SP) today released the first list of candidates for various constituencies, here. The filing of nominations for the second phase of elections for the 65 assembly segments will begin tomorrow. Despite the hullabaloo by the BJP over the World Bank loan, the Himachal Pradesh government, union ministry of finance and the international funding agency signed an agreement sanctioning $200 million (Rs 800 crore) to the state at Delhi, yesterday. Convener of BSP Vijay Singh Mankotia and state BSP in charge Man Singh Manhera today addressed public meetings at Shillai and at Bara Chowk here. Mankotia levelled several corruption charges against the Chief Minister and his wife. Hamirpur SDM R.K.Pruthi yesterday organised a special session for mediapersons to apprise them about the functioning of electronic voting machines (EVMs) today. With no road connecting the remotely located five polling booths of the district, thousands of electors will be forced to trudge miles to cast their votes for the December 19 Assembly polls. Though as many as 3,066 electors reside in these five polling stations, yet they have remained unconnected till now. Two persons were killed and three were critically injured as a truck ( HP-17-3404), on its way from Paonta to Shilla village in Shillai tehsil, fell into a deep gorge at Kali Khan, near Shilla village, about 80 km from here, today. The Himachal Pradesh Youth Development Federation has sought a probe by the CBI into the death of Yamini, a Class X student of St. Joseph School, Faridabad (Haryana), who drowned into the Ravi at Parel near here, early this week. Influenced by the Hindu marriage custom and local culture, an American girl, Ani Logan Spirish, came all the way from South Korea to Jiyanna village under the Nadaun subdivision to solemnise her marriage with a local boy at Toani Devi temple of the district today. The Himachal Pradesh State Electricity Board Union has supported the agitation of their Punjab counterparts against the unbundling of the Punjab State Electricity Board. Kesh Pathania, a former president of district NGOs and the HP Draughtsman Association, joined the BSP at a workers' conference organised by state unit general secretary Krishan Kumar Kaushal at Tobba, about 80 km from here, on Tuesday. BSP general secretary Maan Singh Manhera and state unit convener Vijay Singh Mankotia were also present. BSNL’s telephone services in Bilaspur and some adjoining districts were disrupted when some mischief mongers allegedly cut underground optical fiber cable (OFC) at Jhalli bridge on NH-21. Though the BSP leadership may have been making tall claims of forming the next government in the state after the present election, the party is yet to make any significant inroads in the politics of the district. Former telecom minister and Mandi sadar Congress MLA Sukh Ram, who had brought a telecom revolution in the state during his tenure said today that he would “ensure a proper berth for his son and former Rajya Sabha MP Anil Sharma and would campaign vigorously in the district and his home segment Mandi Sadar before quitting politics”. The management of NIT, Hamirpur, has suspended 10 students for creating indiscipline on the campus. The decision was taken when few students clashed with each other during a party in the hostel last night. An indication to this effect came here today from Chief Minister Virbhadra Singh who asserted that the Congress would outdo the BJP in all departments of election game, whether it was holding of public meetings, publicit blitzkrieg or onslaught on issued like corruption and discrimination. He said if the BJP planned to hold five election meetings on December 5, the Congress would hold seven big public meetings on November 7 in different parts of the state. Reacting to the reports emanating from the BJP camp that he would be the main target of attack he said the Congress had enough ammunition to pin down the BJP on the issue of corruption. His government did not implicate any BJP leader in cases pertaining to irregularities in recruitments in the State Subordinate Services Selection Board even though the charges of favouritism were proved and former chairman of the board S.M.Katwal was convicted in as many as three cases. It was a direct indictment of Dhumal who had been defending the board inside and outside the Vidhan Sabha all through. Any other leader in his place would have offered a public apology and quit politics after the conviction of Katwal to maintain a minimum level of probity in public life. Virbhadra Singh said now that the BJP wanted to target him he would not hesitate from making public the “deleted” data regarding recommendations made by Dhumal as Chief Minister for selecting candidates recovered from the hard disk of the computer of the Chief Minister’ office and expose him not only before the people but also his own partymen. There were as many as 3015 names recommended for various posts. He said investigation in the case of benami property against Baldev Sharma, BJP legislator from Nadaunta, had been completed, while a challan was likely to be put up in court shortly in the case pertaining to irregularities in recruitment against Rajiv Bindal, BJP legislator from Solan. Virbhadra Singh asserted that the character assassination campaign launched by the BJP against him and his MP wife would not cut ice with the people who believed in “decency” in conduct of leaders and parties and “clean campaigning”. The BJP was resorting to such tactics as it had no real issues to highlight. Regarding the controversy over the allotment of the party ticket to associate members he said there would be no resentment if winning candidates were fielded but the rank and file would be demoralised only if the party went to the electoral arena with weaklings. The Tribune had published a news report ' Help him live' yesterday describing the plight of the youth. Vivek’s father Janak Raj works as a watchman in a local private guest house on a monthly salary of Rs 1,500. Principal Secretary to the Chief Minister T.G.Negi said that the money would be remitted to the PGI for Vivek’s surgery. Vivek left for the PGI today for his surgery. Surender Dutta, Principal of GAV Senior Secondary School, thanking the people for their generosity said that the requirement of money for the knee replacement surgery had been met and no more contributions should be sent. A division Bench comprising Chief Justice V.K.Gupta and Mr Justice Rajiv Sharma directed the Chief Minister Virbhadra Singh and his wife Pratibha Singh to file their reply within three weeks in the petition filed by the former chairman of the Subordinate Service Selection Board, S.M.Katwal, seeking direction form the court to hand over the inquiry of audio CD released by Mankotia against the Chief Minister Virbhadra Singh and his wife to the CBI. The court also directed the centre and state governments to file their replies. The court also issued notices to the former Chief Ministers Shanta Kumar and Prem Kumar Dhumal in the petition filed by the Congress leader Kuldeep Singh Pathania, praying for restraining Mankotia and other political leaders to release any incriminating material. In this matter, the court also issued notices to state BJP chief, Jai Ram Thakur, Mankotia, and state BSP president. While issuing notices to the above said leaders, the Bench directed the state and central government to file their replies. However, on the issue of interim relief, the court observed that in Amar Singh case, the Supreme Court had already directed the electronic and print media not to publish or display unauthorised and illegal recorded telephone tapped versions of any person till the matter is further heard by the apex court. The court further observed that the aforesaid order of the Supreme Court is applied to this case also and no separate order is required to be passed. 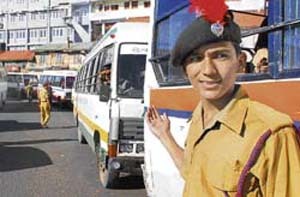 In the third petition filed by Rakesh Kumar urging the court to issue direction to Mankotia to hand over any incriminating material to the police so that the matter be investigated properly , the court issued notice to Mankotia and further directed the state to file its reply within three weeks. Later state party president Shakun Chauhan told mediapersons that the first list of candidates had been released after discussing the winnability criteria of the candidates with party workers and finally decided on these four candidates in consultation with the high command. She, however said the second list of candidates would be released with in next three four days. She said the party had also decided to field its candidates on at least 12 assembly seats across the state, however, the party could also declare contesting of some more seats as certain leaders of The BJP, the Congress and the BSP had expressed to join the party in case they were denied ticket by their respective parties. The chief electoral officer, Manisha Nanda, said the filing of nominations will start tomorrow and the last date will be November 30. She was addressing representatives of political parties for the second phase of elections on December 19. The scrutiny of nominations will take place on December 1 while the last date of withdrawals will be December 3. She said all contesting candidates must submit their dues certificate as per statutory conditions. The agreement was signed by chief secretary Ravi Dhingra on behalf of the state and country director Isabel Guerrero for the bank. The BJP had opposed signing of the agreement while the model code of conduct was in force, but the Election Commission of India allowed the state to go ahead with it. A remarkable feature is that 90 per cent of the Development Policy Loan will be made available to the state as outright grant with no repayment liabilities of either interest or the principal amount. Only 10 per cent of the total loan received will have to be paid back at a nominal rate of interest. Thus, most of the repayment obligations of the loan will be directly met by the Government of India which became possible due to the substantial policy changes effected by the state government to facilitate external funding. It is understood that the first tranche of $100 million (Rs 400 crore) was likely to be made available to the state by the year-end. It will be utilised for strengthening the financial position of the state and create better fiscal space for higher capital outlays in the sectors of health, education, technical education, drinking water and irrigation. This is the second loan agreement which has been signed over the past few months with the bank. Earlier, an agreement was signed for a loan of $220 million (Rs 900 crore) for the funding of the state road project. In this case too, 90 percent of the total amount will come as a outright grant to the state. It is already providing a loan of Rs 1,600 crore for the 412 MW Rampur Hydroelectric Project and keen to fund the Rs 3,500-crore Luhri Hydroelectric Project. In all, the World Bank has, over the past few months, committed funds to the tune of Rs 5,900 crore. He alleged that he had never seen MLAs of Sirmaur fighting for its development as a result of which this was one of most backward districts of the state. Manhera also made several allegations against Congress and BJP leaders. Raksha Negi, daughter-in-law of senior Congress leader of Shillai Lal Singh Negi, the only aspirant for the BSP ticket from Shillai, was projected as a candidate at the meeting. Through a demonstration, the SDM gave a complete insight into the entire process of use of EVMs to mediapersons. The first phase of rehearsal for polling officers of the Mewa assembly constituency was held at Bhoranj today where district election officer Nandita Gupta reviewed the poll arrangements. Bhoranj SDM Satish Sharma gave information about the functioning of EVMs to polling officers. These polling booths include Beral-Siharli in the Arki constituency, Tarangala in Doon, Jabhakar in Nalagarh, Neri-Kalan in Kasauli and Dhangeel in Solan constituency. The Beral-Siharli polling booth which covers Sui, Bui, Matrej, Sakor and Chanda villages houses the most remote panchayats. Despite various schemes like the Prime Minister’s Gramin Sarak Yojna providing funds to link villages having population of more than 150, these villages have found no road link so far. This booth alone covers a population of 421 the voters will be compelled to travel around 5 to 7km on foot. In yet another case, Tarangla booth where a population of 572 is housed, four villages - Tarangla, Dhabota, Batnech and Kyartu - will cast their votes after travelling a distance of 3.5 km on foot. Older citizens will face difficulty in casting their votes in these remote areas. As many as 879 villagers residing in Koena, Jhangariya, Oddal and Kamlog falling under the Neri Kalan polling booth in the Kasauli constituency too have an arduous task as they have to walk a distance of 5 km to cast their votes. Being a difficult hilly terrain they have to invest a sizeable time in reaching the booth. A similar plight awaits nearly 300 villages falling under the Dangeel polling booth in the Solan constituency where voters have to walk nearly 4 to 6 km to reach the polling station. The Jabhakhar polling station having the highest population among booths lacks road connectivity and 894 voters there will travel at least 3km on foot to cast their votes. Interestingly, while the political parties have been showing little interest in linking these remote villages to roads they exhibit a high voter turnout. Though no concrete figures were available, but a panchayat pradhan Ashish from Doon constituency said the votere turnout will be quite high in these polling booths. Even on the day of the poll, the political parties will engage vehicles to facilitate the voters but little is ever done to lend the voters of these remote villages a helping hand in reaching out to the booths rued Ram Lal from the Beral panchayat. Shimla (UNI): Over 400 persons in a remote area of Kangra district are unlikely to cast their votes in the as the nearest polling station is about 72 km away from their panchayat. Residents of the Bara Bhangal panchayat in the Baijnath constituency would have to cross the Tamsar Pass at about 16,000 feet or else undertake a 300-km-long journey by bus from Holi in Chamba to reach Bir, the nearest polling station. However, the villagers are not keen to travel such a long distance to cast their votes. ''Unless a polling station is set up in the Bara Bhangal panchayat, there is no likelihood of anyone going out and vote in the assembly elections,'' 23-year old woman pradhan Kanchana Devi was quoted by the local media as saying. Kangra DC Ashwani Kapoor, however, said the administration would do whatever possible to ensure that the villagers were not denied an opportunity to cast their votes. Police sources said Hakam Singh (29) of Pab village and Anil Kumar (25) of Shilla village were killed on the spot while three others, including driver of the truck Sia Ram, Dani Chand and Babu Ram, were critically injured. Villagers and the Shillai police sent the injured persons to various hospitals, including the PGI. The condition of Babu Ram is stated to be critical. The police has registered a case. Kullu: Tek Ram, an employee of Government Middle School, Najan, was killed and 17 were injured, one of them seriously, when a private bus (HP-66-7503) rolled into a deep gorge at Rauli, near Gadsa, in this district on Wednesday. Initial investigation revealed that the driver of the bus lost control over the vehicle, making it go off the road. The injured were admitted to the local Regional Hospital, where one of the legs of the driver had to be amputated. Baldev Thakur, SDM, Kullu, said Rs 15,000 each was given to the seriously injured, Rs. 5000 each to four with grave injuries and Rs 1000 each to the other injuread persons as immediate relief. The body was handed over to relatives after a postmortem. 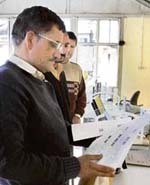 State president of the federation, Dr Ajeet S. Bhardwaj, in his letter to the UPA chairperson Sonia Gandhi, urged to direct the CBI to initiate probe as to how the water was released by the Chamera Hydroelectric Project authorities working on the Ravi without sounding any alarm for the people living downstream the Ravi in Chamba district. Ani, a US citizen, and Karam Singh, a resident of Jiyana village, got married as per Hindu marriage customs this morning where relatives and large number of local people not only participated in the marriage ceremony but also blessed the couple. Advisor of the Tohni Devi temple committee Dalel Singh performed all ceremonies as the father of Ani and performed the Kanyadan of the girl as per the Hindu customs. Ani, who was teaching in South Korea, met Karam Singh, who worked as a manager in a hotel in Thailand, as a tourist. After being friends for more than two years both decided to get married. When the question of solemnising the marriage was discussed between them Ani opted to get married in the native village of Karam Singh as per the Hindu marriage customs and local tradition. Ani has obtained permission from the US Embassy in New Delhi to solemnise the marriage here. The union maintained that the law under which the boards were being dismantled on the pretext of reforms in the power sector was not in the interest of the government, the employees or the consumers. The government should see the financial position of the boards which had already been trifurcated. It pointed out that the financial health and performance of boards in states like Andhra and Orissa, the transmission and distribution losses had increased. Kaushal said Congress leader of Kotkehloor Surendra Kumari, a former president gram panchayat of Reeh, had also joined the BSP along with hundreds of her supporters. Surendra Kumari had been appointed President of the women's wing of the Kotkehloor constituency unit of the BSP. Other Congress leaders who joined the BSP at Tobba were Nanak Dev, Devi Ram, Indru Ram, Amar Chand Thakur and Rattan Lal Kaundal. Divisional engineer telecom, K.R. Chauhan, said here today that the services were disrupted at Naina Devi, Swaharghat, Garah, Doriyan, Bassa, WLL BTS’s Naina Devi Ji, Swaharghat telephone exchanges, Jaggatkhana, Swaharghat, Swahan, Tarsooh, Bhakra, Behal, Majari. The SBI leased lines (online banking services) were also failed but were restored within 12 hours by yesterday evening. After holding a few meetings in the district in the past few months the BSP leaders have failed to attract any known leader from the BJP or the Congress. While weak party structure in the district has been responsible for the failure to rope in any big leader, the highly polarized politics of the district between two major political parties i.e. the Congress and the BJP has also made things difficult for the BSP leaders. BSP candidates had contested in two Assembly constituencies in Mewa and Naduanta in the last Assembly election, but both the party candidates were able to muster few hundreds vote only in both these constituencies. The division of voters between the Congress and BJP has left little scope for the third party to create a niche here and the BSP is also finding it difficult to make a place for itself. Basking under the glory of Mayawati’s significant victory in the last election in Uttar Pradesh and projection of Vijay Singh Mankotia as the next CM, the BSP leaders were quite hopeful of getting good response in the lower areas of the state, including Hamirpur. But it seems now the BSP leaders are relying more on rebel candidates from both the BJP and the Congress, who would like to enter the fray in case of denial of a party ticket from their parent parties. Since rebels from both parties had contested in Mewa, Nadaunta, Nadaun and Hamirpur constituencies during the last elections and secured good number of votes too. The BSP leaders are keeping a sharp eye on the developments and waiting for the release of lists by both parties. Setting to rest all rumours doing the rounds here that Sukh Ram would quit politics as his wish was to allot party ticket to his son for the coming election. Sukh Ram instead stated that he would first see that his son won the election and get a “proper berth” in the government and then he would think over whether to quit or not”. Talking from New Delhi on the phone today Sukh Ram said: “I would first campaign in Mandi Sadar and then will tour the district to campaign for the party”. Sukh Ram’s new about-turn has surprised not only Congressmen more particularly the two ministers - IPH minister Kaul Singh Thakur and excise and taxation minister Rangila Ram Rao - who hold fort in Mandi district as far as the Congress is concerned, but also has raised speculations in the Congress circles about this “new mission”. Party insiders revealed that it was because of Sukh Ram’s now defunct Himachal Vikas Congress (HVC) that the Dhumal-led BJP government had come to power in the state in 1998. Sukh Ram’s candidates still figure in the list of both the BJP and the Congress, they added naming Parkash Chaudhary in Balh (reserved) Congress, Mansa Ram, BJP candidate from Karsog and others. Party sources said even the Congress till the last minute tried to rope in Mansa Ram as he was being tipped as a winning candidate from Karsog. “Sukh Ram enjoys a support base in the district and he can make or mar the poll prospects of the candidate in district”, they added. Registrar of the institute, G.R. Bharti, said the students have been suspended till the completion of inquiry being conducted into the incident.